Zazhut is free, and his wrath now descends upon Eo. The Shaikan are hopelessly outnumbered – but you, an Elder of the Shaikan, are not willing to give up hope. Joined by companions old and new, you head out towards the Realm of the Gods, for only they seem able to oppose Zazhut's power. However, the Gods play a game of their own, and don't seem to be inclined to help you... The fate of Eo now rests within your hands; face the demons of the past, collect information about Zazhut and banish evil from this world, once and for all. Much has changed in time... are your foes as dangerous and your friends as faithful as they used to be? Nvidia GeForce 8800 / AMD Radeon HD 3870 or better. Other cards may work, but are not explicitly supported. Nvidia GeForce 560 / AMD Radeon HD 6850 or better. Other cards may work, but are not explicitly supported. © 2014 by Nordic Games GmbH, Austria. Developed by Nordic Games & Mind Over Matter Games. Published by Nordic Games GmbH. 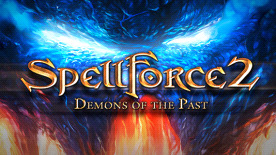 SpellForce is a registered trademark of Nordic Games Licensing AB, Sweden. All other brands, product names and logos are trademarks or registered trademarks of their respective owners. Uses Bink Video. Copyright (C) 1997-2013 by RAD Game Tools, Inc. Uses Miles Sound System. Copyright (C) 1991-2013 by RAD Game Tools, Inc. Uses Steam. ©2009 Valve Corporation. Steam and the Steam logo are trademarks and/or registered trademarks of Valve Corporation in the U.S. and/or other countries.